HP's iPaq has always offered a good range of features, and excellent usability, but has long been lacking in style. The iPaq rw6815 Personal Messenger (£365 inc. VAT) attempts to address this. 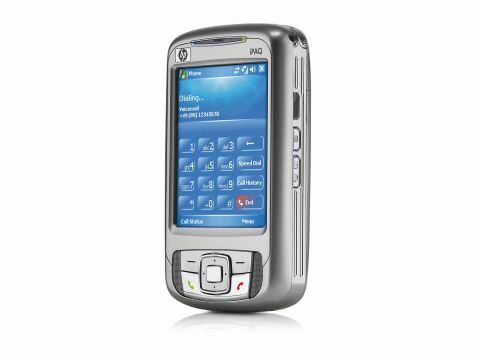 Finished in silver, with splashes of chrome, it looks more like a smartphone than Pocket PC. It's a connected device, and features a 2.7-inch touchscreen with a 240 x 320-pixel resolution. Images are sharp, and colours vibrant. We found the display responsive, although too small to write comfortably on. When it comes to using the device as a phone, call quality is excellent, but dialling using the onscreen buttons is awkward, as it can't be done without looking at the display. The Windows Mobile 5.0 Phone Edition software can be navigated using hardware buttons below the screen. Processing power comes from a 412MHz Intel chip, and we found it to be proficient for most tasks. With a total 192MB of memory, there's enough space for plenty of data. If you want to store large video or music files, you'll find a mini-SD card reader built-in. The standard array of Windows Mobile applications are included. EDGE technology enables fast connections to the internet via Internet Explorer Mobile. Wireless connectivity is excellent, with an 802.11b Wi-Fi adapter for connecting to networks, and both infrared and Bluetooth for transferring files to other devices. There's a 2-megapixel camera on the back of the handset that takes photographs of reasonable quality. We found the latest iPaq to be genuinely useful. Its small size allows you to use it both as a phone and Pocket PC, although the change to a smaller form factor has compromised usability slightly.